Edge corrugated, 10 corrugation sectors. Abū Naṣr al-Fārābi (أبو نصر محمد الفارابي - Abū Naṣr Muḥammad al-Fārābi; in some sources also mentioned as محمد بن محمد بن أوزلغ الفارابي - Muḥammad ibn Muḥammad (ibn Tarḫān) ibn Awzlaġ al-Fārābi), known in the West as Alpharabius (c. 872 – between 14 December 950 and 12 January 951), was a Persian polymath and one of the greatest scientists and philosophers of Persia and the Islamic world in his time. He was also a cosmologist, logician, musician, psychologist and sociologist. 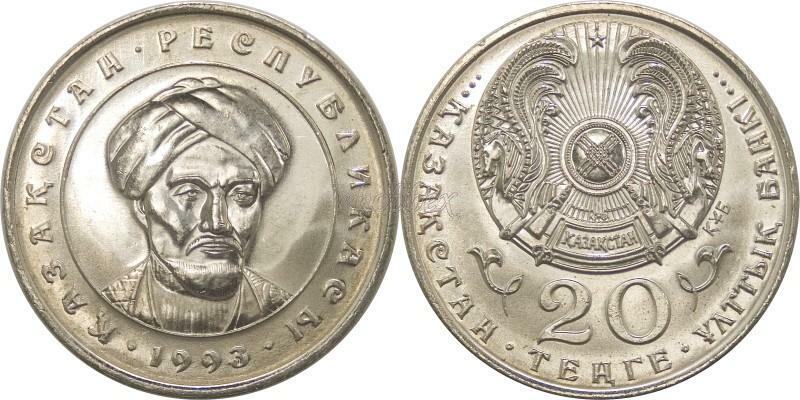 On the top of the coin face you can see a national Emblem of Kazakhstan and a '20 ТЕҢГЕ' face value underneath in two lines, to the right of the Emblem a 'ҚҰБ' Kazakh legend. To the left and the right of the face value a national design element. A 'ҚАЗАҚСТАН ҰЛТТЫК БАНКI' Kazakh legend as a circumference. In the center of the underside you can see an imprint of Abu Nasir Al-Farabi portrait. On the circumference there is a 'ҚАЗАҚСТАН РЕСПУБЛИКАСЫ' Kazakh legend separated with the engrave Year in the bottom.